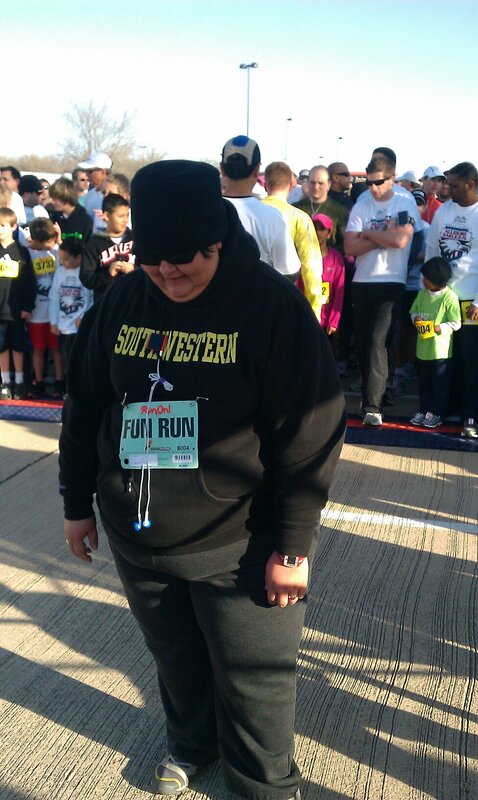 This is me, after doing a miler at a school-district sponsored fun run. I did this race in 29 minutes on a very, very cold March morning last spring. The last time I did a miler, I weighed 30 more pounds than I do now and I did it in a hair under 30 minutes. I thought I did a pretty good job, considering that my left knee was on fire, it was about 40 degrees out and I was itching all over since I get hives from being in the cold for too long. This time, I hope to weigh at least 30 pounds less than I am now. This will put me at a weight I have never seen as an adult–under 300 pounds. I also hope that I can complete it in 20 minutes or less. My left knee will probably still be en fuego, but I’ll brace it this time before the race begins to minimize the pain. I’ll probably also wear the calf sleeves I bought to help with my varicose veins (a subject for another post). I am slowly working on improving my fitness, because it is still a bit painful for me to exercise. When you are as heavy as I currently am (and have been), moving can be a painful proposition since there is quite a bit of wear and tear on my joints. So I have been taking 15 minutes to go on a walk during my planning period each day at school. I work on a campus that is a million square feet, and a third of a mile from one end to the other so there is plenty of air conditioned space to walk in! I’ve been hitting 7,000+ steps nearly every day that I have done this, so I’ve decided to ramp things up a bit by adding 500 more steps a day starting next week. I’m also walking around my classroom a lot more and not tethering myself to my lab stool at the front of the room, so this has helped me get to my step goal each day as well. Once the temps start to cool off a bit more, I’d like to go walking in the park near my house because it has a really nice walking trail, and there’s lots of cool stuff to see–herons, egrets, ducks, nutria and turtles in the creek. I’m also planning to buy my rec center membership come payday so that I can start walking in the pool and use the indoor walking track once it becomes too cold to walk outside (those damned hives are really annoying). I am excited about getting to participate in the Mosey, because even though it is only a mile, I am doing it because I am trying to hit a goal of finishing in under a certain time. I know that there will be folks who finish the entire 5K race that will be running simultaneously while the Mosey goes on that will finish that race before I finish the mile, but I don’t care. I want to prove to myself that I can walk a mile in 20 minutes. I figure that by that time, I will have even more weight off and making a 20 minute mile will be a possibility. 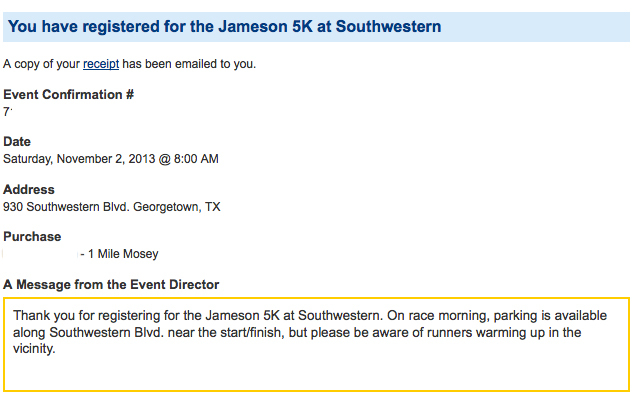 I am hopeful that by my 41st birthday in March, I will actually be able to complete a 5K. I’d like that to be a goal of mine–to do a 5K by my 41st birthday. I might not run it, but dammit, I want to finish one. 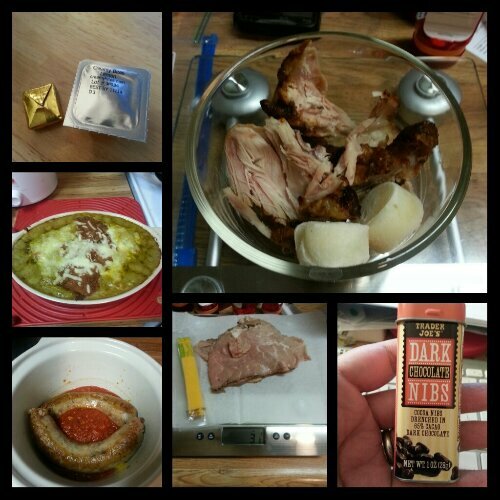 Wednesday’s Bites, from top right: Barbecue chicken and Trader Joe’s mashed potatoes; Trader Joe’s dark chocolate nibs; sliced roast beef and a Sargento reduced fat cheese stick; Italian sausage, peppers and onions in marinara; green chile chicken casserole; multivitamin and calcium supplements x2. 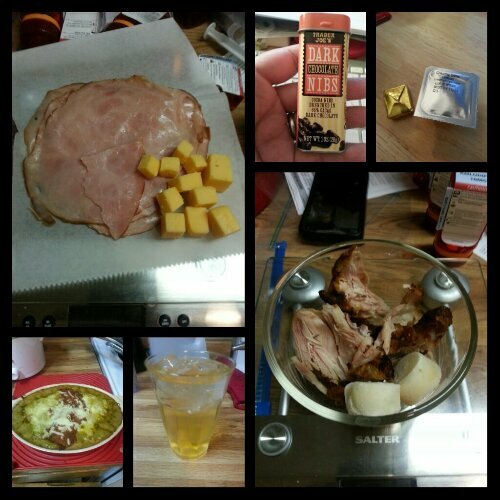 Thursday’s Bites, from top right: multivitamin and calcium supplements x2; barbecue chicken drumstick and Trader Joe’s mashed potatoes; Isopure Zero Carb; green chile chicken casserole; honey ham and Tillamook sharp cheddar cheese cubes; Trader Joe’s dark chocolate nibs. Not shown: Rudy’s pinto beans with smoked turkey and ham. This entry was posted in celebrations, challenges, NSV's, post-op, the little things, vsg, weight loss surgery, werk! and tagged challenges, daily bites, exercise, post-op eating, post-op life, trying new things, VSG, vsg realness, werk!, workin' on my fitness. Bookmark the permalink. I would love to walk with you! I won’t know if I can until mid-October, because Rob is having surgery that month and I’m not sure how things will be. But if I can join you, I’d love to. If you are able to, I’d love the company! If not, I completely understand. I hope Rob is doing okay–have been thinking of you guys and hoping all is well healthwise for him.